Update: I was able to get additional photos this afternoon. I have added them, plus additional comments, in a second post. Yesterday my son told me he saw an Orange-crowned Warbler (well, I think it was some other color crown, but he still has a little trouble keeping all the names he is learning straight) outside his window. He said it flew around to the side of the house, so I went out to take a look and got a very brief glimpse at a bird that was clearly a warbler. 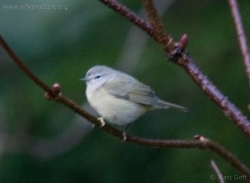 I did not get a good enough look at it to identify it, but it did not look that far off from an Orange-crowned Warbler. 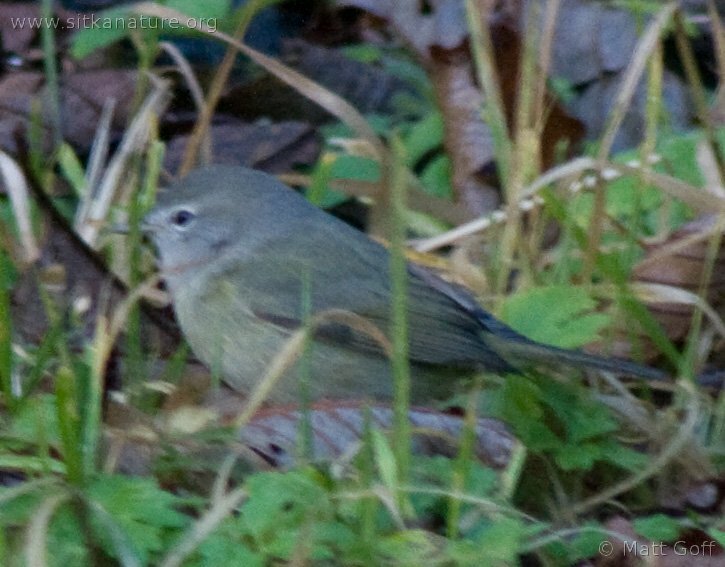 I told him to keep an eye out for it, and we saw it very briefly, but I did not see enough to make me think it wasn’t an Orange-crowned Warbler. This morning he told me that it was outside again, so I went outside to take a look. It seems to be hanging around in a loose association with the neighborhood junco flock. The first thing I noticed about its appearance was how grey it seemed. Much moreso than I associate with Orange-crowned Warblers I have seen around here before. 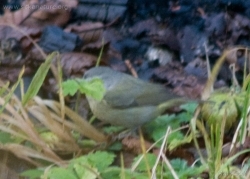 I was able to get a few pictures (of marginal quality) in the dim light, and I hope they’re enough to get an identification, but so far I’m stumped. I’m assuming this is a first year bird, but it still looks different than the Orange-crowned, Yellow-rumped, and Yellow Warblers I’ve seen around here before. 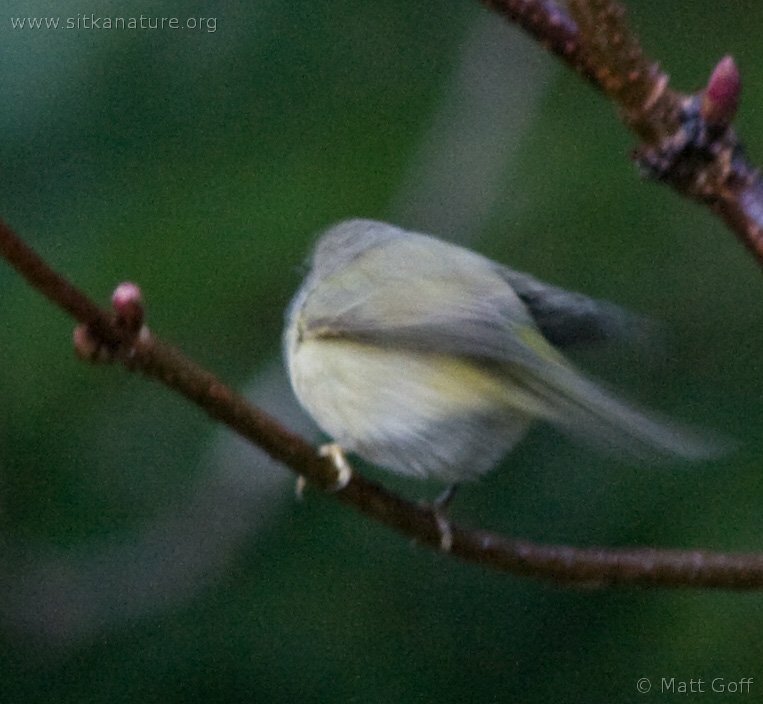 The lack of streaking and yellow rump seems to rule out Orange-crowned Warbler, both Pacific and Taiga. 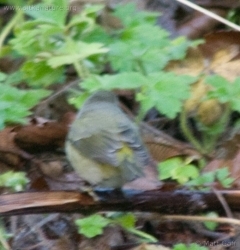 First winter Tenessee Warblers appear to be much yellower overall but without a yellow rump. Virginia’s Warblers (never reported in Alaska, so very unlikely based on geography) seems to be ruled out by the broken eye-ring and pale supercilium. 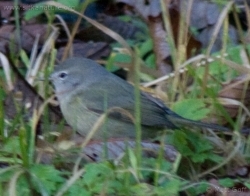 Nashville warbler seems ruled out by broken eye-ring, pale supercilium, and lack of pale on throat and breast. Yellow Warbler seems ruled aout by yellow-rump, lack of pale edges on tertials, and broken eye-ring. Yellow-rumped Warbler seems ruled out by lack of white edges on coverts, pale supercilium, yellowish undertail coverts, and grayish (rather than brownish) coloring. Palm Warbler seems to have stronger (and longer) pale supercilium, some streaking, a more brownish color, and white corners to its tail (which I did not see when this bird flew). Those are the closest I could come up with, but they all seem to be problematic for one reason or another. Hopefully I will see this bird again and be able to get some better pictures of it, but that remains to be seen. This entry was posted in birds, identification. Bookmark the permalink. 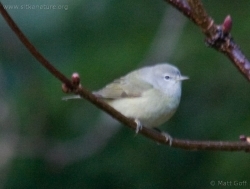 This is an Orange-crowned Warbler. Thanks for the quick reply. I’ve never seen an Orange-crowned Warbler with a yellow rump like this bird seems to have. 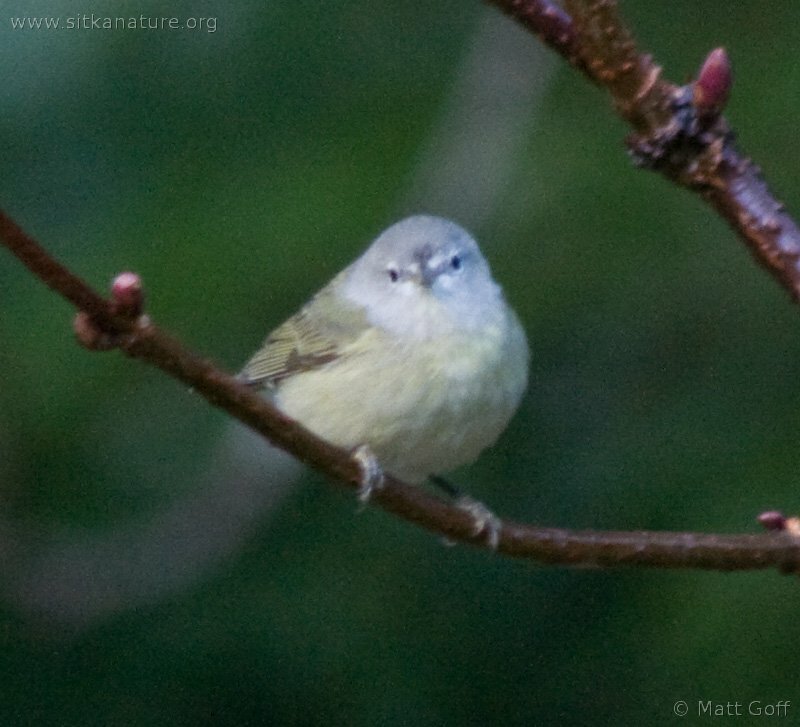 Also, looking in Sibley’s, the Orange-crowned Warbler juveniles have pale on their wings (not quite bars), which this bird does not have. On the other hand, the broken eye-ring, and pale gray of the head, throat, and breast seem good for an Orange-crowned Warbler of the Taiga race. If that’s what this is, it would be interesting, as it’s not the typical subspecies seen here, as far as I know. Perhaps someone can comment on the apparently yellow rump and lack of pale markings on the wings that are what keep me from going with Orange-crowned Warbler for now. I forwarded your I.D. request to a bird watcher web site: http://davesgarden.com/community/forums/t/792886/ This is the reply from the resident expert there. 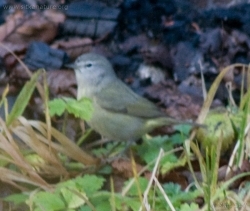 I’d agree with Orange-crowned Warbler, subspecies celata (‘taiga’ in Sibley; as opposed to the local west-coast breeding lutescens), though that yellowish rump is odd (the yellowish under-tail coverts do fit). Slightly reminiscent of Virginia’s Warbler, but that doesn’t fit on other characters (e.g. has complete eye ring). Otherwise, it looks very like a Chiffchaff (Phylloscopus collybita) from my side of things (it breeds as far east as about 145°E in eastern Siberia). But again, the yellowish rump is the sticking point. Of others from Siberia, Dusky and Radde’s Warblers can be counted out, they both have much more prominent supercilia.